A masterclass in orchestral recording. Legendary producer and artist Alan Parsons, GRAMMY award-winning arranger and conductor Tom Brooks, A-list session players Vinnie Colaiuta, Nathan East and Jeff Kollman, internationally renown concert cellist Michael Fitzpatrick, a full symphony orchestra, plus Peter Cottontale, Nate Segal (aka Donny Trumpet) and Nate Fox from Chance The Rapper's The Social Experiment combined to create one of the most action-packed and diverse master classes in our five year history at Hybrid Studios in Orange County the weekend of March 24th and 25th 2018. Day One began at a measured pace when Alan guided attendees through the tracking room, stopping off at Vinnie Colaiuta's Gretsch kit to show and explain his drum miking philosophy. Next stop Nathan East, still firmly attached to his now legendary and extremely hard to find NE1 DI box to power the Eric Clapton and Fourplay bassist's custom Yamaha 5-string. Guitarist Jeff Kollman sported an impressive array of stomp boxes ahead of the obligatory Marshall stack, while arranger and keyboard player Tom Brooks oversaw the proceedings from behind a Korg Kronos and a phalanx of orchestral instrument plug-ins. The track being recorded had just been unveiled as Paul Dukas' The Sorcerer's Apprentice, written in 1897 and famously used in Walt Disney's Fantasia. Given a complete tonal makeover in the rhythm department, it wasn't long before the tracking session added prog rock style depth and power to this already complex and challenging piece. All the musicians, though reading music, still managed to stamp their own playing personalities on the music. By a late lunch the track was in the bag and it was time to relax a little alongside mouth-watering, custom-cooked tacos supplied by self-styled Luscious Jimmy's catering. 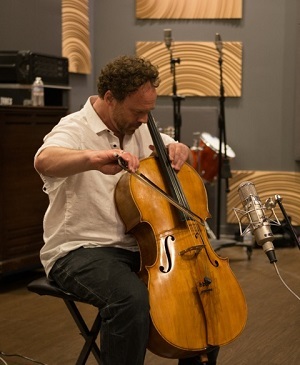 Thus fortified, the afternoon session began with the recording of the piece's solo 'cello part by world-renown cellist Michael Fitzpatrick who had flown in specially from Colorado. Michael's tone is legendary, as evidenced from his long-standing appearances alongside the Dalai Llama with the acclaimed Tuning The Planet project. The day then drew to a close with Tom Brooks explaining both his and Alan's philosophy and practicalities of the arrangement in preparation for the following day's orchestral session. 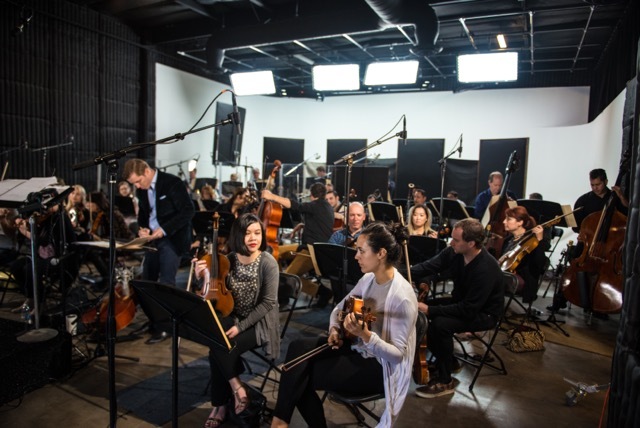 The orchestral session took place in Hybrid Studios' roomy sound stage. The seating and basic miking had already been set up before attendees arrived. First up was Alan's explanation of what he was hoping to achieve and how he was proposing to achieve it with some thirty-seven mics in the room. Aiding and abetting the single mic per pair of instruments miking arrangement was a Decca Tree configuration overhead the conductor's podium plus a brand new Sennheiser AMBIO VR mic with its four KE 14 capsules for capturing 360 degree audio via four discrete tracks - once you download the format converter VST. Attendee and ambisonics specialist Jim Stern had brought the Sennheiser along and explained the technology to a fascinated crowd - including Alan. As lunch drew to a close (sumptuous BBQ today) the orchestra began to arrive and by 2PM were in place for the start of an intense orchestral recording. Dukas' composition and Brooks' arrangement represent some seriously challenging playing but after a handful of run-throughs with the odd stop-over to perfect the trickiest passages tracking began. Brooks' exuberant conducting style energized the 45 piece orchestra who produced a finished recording that was both technically and tonally excellent. And that's not all, as they say. With The Sorcerer's Apprentice in the bag it was over to rap artists Chance The Rapper's The Social Experiment for Alan to produce Brooks' orchestral arrangement of new a Peter Cottontale cut. With its minimalist 808 beat and ghost vocals the contrast could not have been greater with what had gone before. But it demonstrated the power of music to push many buttons and cover many bases. Alan and Peter - at least two generations apart - worked easily and respectfully together and created a superb bed for the young illustrious crew to complete in the coming weeks. After the orchestra left at 5PM Alan re-directed his efforts back to the weekend's main squeeze, rattling off an impressive mix that was rapidly uploaded to LANDR, one of the event's sponsors, for a 'progress master' - the perfect scenario for the online platform. Over the course of the weekend Attendees also had the chance to experience Waves' stunningly effective Nx 'surround on any headphones' software, complete with the HeadTracker unit that tracks your head movement in order to shift the balance and mix of perceived sound placements accordingly. From technology to playing technique, from a classical cellist to a rap collective, from great food to good vibes, Orchestral Maneuvers was far more than a master class. It was a true feast for all the senses and all the sensibilities. Hybrid Studios is a multimedia Orange County production facility that features analog and digital recording studios alongside a massive soundstage. Travel Advisories: . Airport: Nearest is Orange County's John Wayne Airport. Amtrak: Nearest station is Santa Ana (7m). Alan Parsons is not only a multi-platinum engineer and producer he is also an artist in his own right. Between 1975-1990 The Alan Parsons Project's theme-based brand of progressive pop racked up multiple hit singles and albums including the classics Eye In The Sky, I Wouldn't Want To Be Like You, and Games People Play. Post Project, Alan Parsons released several notable albums including Time Machine, On Air, Try Anything Once, and A Valid Path. 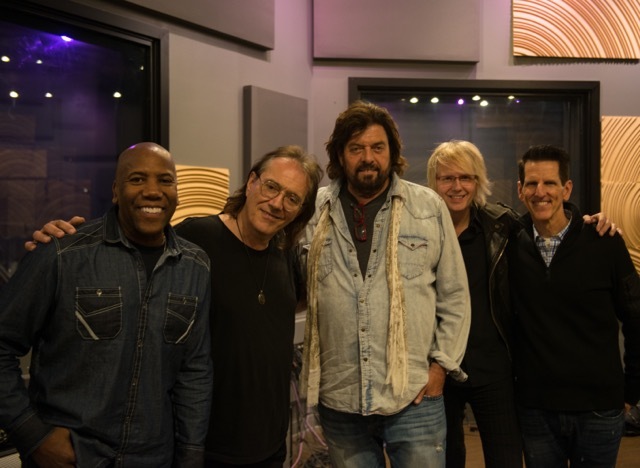 Although Alan has released several singles since A Valid Path Orchestral Maneuvers is a landmark event, marking the birth of the first Alan Parsons album project since 2004. Session greats Vinnie Colaiuta (drums) and Nathan East (bass) were the rhythm section for the tracking session on Day 1. Vinnie Colaiuta's pedigree in rock and jazz drumming is staggering. From his early days with Frank Zappa to his work with Herbie Hancock and Chick Corea, to Sting, to Jeff Beck, Steely Dan, Barbara Streisand, and Paul McCartney, Colaiuta's discography is as powerful as it is multi-faceted. Nathan East (a frequent recording collaborator with Colaiuta) has no less of a jaw-dropping track record. From his early work with masters of soul and funk like Barry White and The Love Unlimited Orchestra, East went on to wow aficionados of peerlessly tasteful bass playing with Eric Clapton, Phil Collins, Nile Rogers, and Pharrell Williams, amongst a barrage of other top artists. Rounding out the tracking session was the excellent prog rock guitar specialist Jeff Kollman (Chad Smith’s Bombastic Meatbats, Asia, and Glen Hughes) who also appears live with the Alan Parsons Live Project. Virtuoso cellist Michael Fitzpatrick has directly shaped a global vision of tuning the planet, from The White House to the Royal Palace in Jordan; from the United Nations to the Parliament of World’s Religions in Australia; from performing for Sir George Martin of The Beatles to a performance in a Tibetan temple in the remote tip of Southern India; from the United States Capitol West Lawn with His Holiness the XIVth Dalai Lama to soloing at the Hollywood Bowl. Michael plays the Gemunder / Injeian ‘Golden Cello’ restored by Master Violinmaker Phillip Injeian of Pittsburgh. 10.00–10.45 Alan introduces the musicians and sets goals for the tracking session. 10.45-12.00 Miking the drums with Vinnie Colaiuta. Discussion with Nathan East on current developments with recording bass. Guitars and keys set up. 12.00–1.00 Tracking session initial run-throughs. 1.00–2.00 Lunch with Alan and the musicians at Hybrid Studios. 2.00–4.15 Tracking session continues, followed by guitar doubling and Hammond overdubs. 4.30–6.30 Presentation and dissemination of the MIDI orchestral arrangement with Alan Parsons and Tom Brooks. 6.30–7.30 General Q&A with Alan Parsons. 11.00–1.00 The orchestra: Stage plots, instrumentation, miking options, techniques, and challenges shown and discussed in the live room. 1.00-2.00 Lunch with Alan and the musicians at Hybrid Studios. 5.00-6.30 Evaluation of the orchestral session and A/B with the MIDI arrangement followed by an initial mix. 7.00 Champagne Reception, photo opportunities and presentation of Certificates.